Written by Janet Choi on June 4, 2015 . Why does this happen? People hate losing more than they love winning — and it turns out this very human tendency can impact the success of your business. a powerful conservative force that favors minimal changes from the status quo in the lives of both institutions and individuals …. it is the gravitational force that holds our life together near the reference point. That magnetic tug occurs, even with something as trifling as a coffee mug. In 1991, Kahneman and his colleagues performed an experiment to examine the differences in valuation that can result from loss aversion. In the study, participants were randomly designated as sellers or buyers. Sellers got a mug that normally sold in the store for $6.00. The researchers then asked the sellers what the minimum amount they’d be willing to accept to sell the mug and asked buyers the maximum price they would pay to purchase the mug. Buyers were willing to fork over a maximum of $2.87 for the coffee mug. Sellers, on the other hand, wanted at least $7.12. Sellers were parting with something they possessed — even for such a short time — and due to that loss aversion, they valued their mug much higher than the buyers did. That’s the endowment effect at work, the tendency for people to assign more value on things simply because they own them. The “but it’s mine!” feeling hiked up the perceived value by more than double. For example, there is no loss aversion for an old car that is traded in as part of the purchase of a new car if the new car is perceived as having all the benefits of the old one. Your job isn’t over when somebody signs up for a trial or free account. What are you doing to deliver value and benefits once that has happened? 1. Start users on trials with premium features. 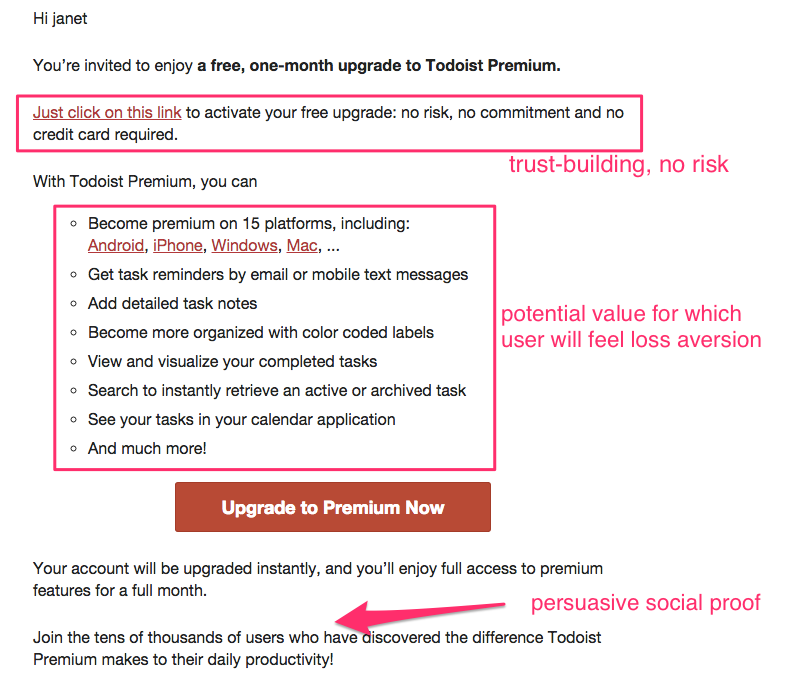 SaaS businesses with freemium models, like Datahero, often start people out on trials with premium features and then switch them over to the free plan if they don’t upgrade. 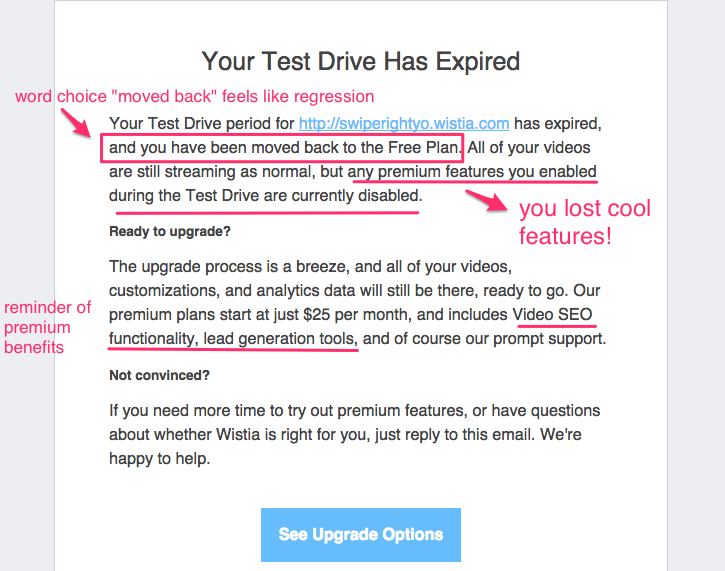 Wistia also starts people off with premium features to “test drive.” Here’s how they invoke loss aversion in their final trial notice email: Followup.cc leans heavily on loss aversion in its upgrade email, after starting you on a free trial with premium benefits. 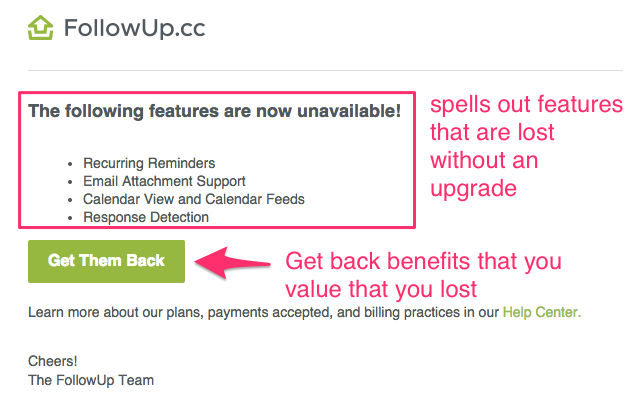 Given what we understand about loss aversion, this email could have been even stronger if it invoked the benefits, not just the attributes, of the premium features — reminding people that they could be losing powers to organize, be productive, and build relationships. 2. Offer a trial of a premium plan later on. 3. Give a trial of a special premium feature. There may be certain features that push people to really adopt your tool and become power users — whether it’s advanced search capability or access to useful tracking and reports. 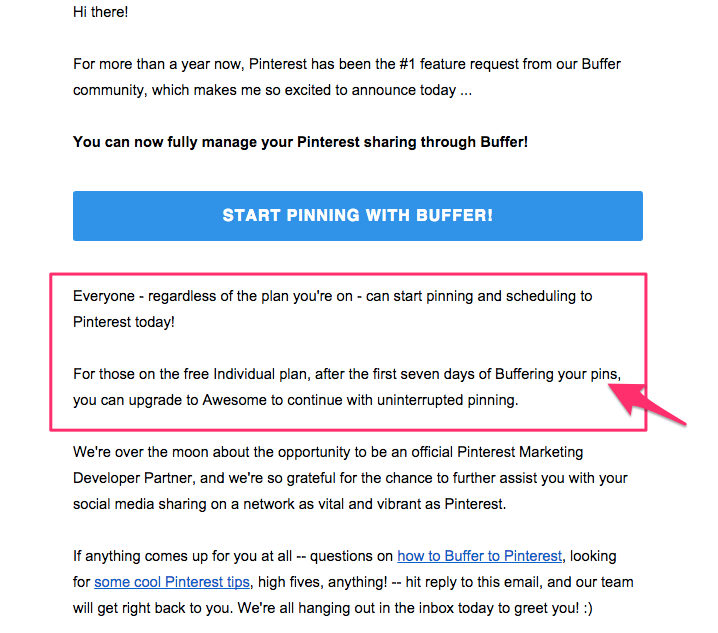 For Buffer, their absolute number one feature request was to include Pinterest sharing. The new feature is only available with paid plans — but the Buffer team chose to give their freemium users a chance to try out the feature and experience its value. click for full email If you have a major feature release like this that you know has great demand and impact, consider treating the feature like its own product. Loss aversion is a cognitive tendency that helps convince people to become customers or even upgrade to higher plans. But there are meaningful prerequisites: users must realize benefits, not merely experience attributes — so much so that they feel a sense of ownership. That calls for proactive work on great onboarding and activation during a trial period to engage, build trust, and help people succeed so that they experience real benefits and value — so that there is something to lose. Check out more upgrade email examples and 5 copy templates that you can start using today: How Great SaaS Companies Write Trial Conversion Emails.